Andy Murray, Scottish professional tennis player, who has been ranked as British No. 1 since February 2006, has won Wimbledon Championship mens singles title in 2013, and is the 2012 Olympic tennis men's singles champion. At the 2012 US Open, Andy became the first British player since 1977, and the first British man since 1936, to win a Grand Slam singles tournament. This title makes him the only British male to become a Grand Slam singles champion during the Open Era. 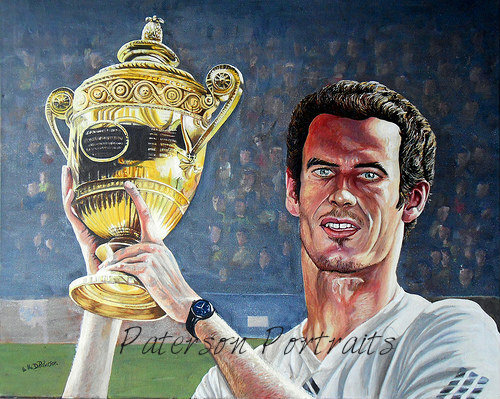 This Oil on Canvas Portrait is a celebration of hiis achievements in Tennis and being a Scot I am very proud of Andy Murray and his dedication and commitment to the sport.